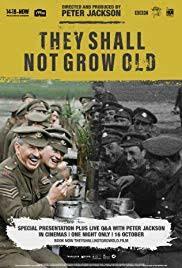 Review: A documentary about World War I with never before seen footage. This is to commemorate the centennial of the end of the war. What I enjoyed about this film is that it told the story of World War I from beginning to end. It started off with the news about the war and soldiers going off, then about what it was like in the war and then finished off with all the men returning home at the end of the war. I thought it was amazing the footage at the beginning in black and white and then after half an hour the picture then went into colour. Also at the beginning it is silent then we start to hear voices. It is lovely how there is no historian talking to you or explaining to you what is going on or even giving you any facts. It is great how we can just sit and enjoy it without any interruptions. Apparently this was four years in the making. This is an utterly breathtaking film. Agreed Beth, really enjoyed this too.